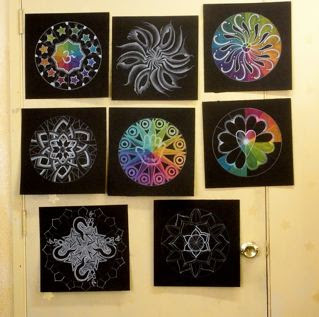 I am very pleased to announce that we are finally going to be able to show many of our Illuminated Mandala's in an art show here in Sonoma County. 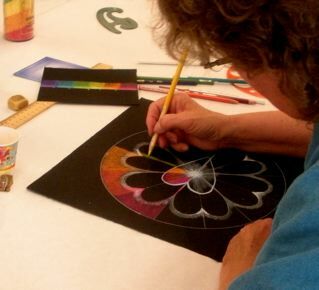 Myself and Patricia Waters, my co-facilitator in the Illuminated Mandala Process, will be having a show of our Mandala's at the Journey Center, in Santa Rosa, CA. The opening will be on Friday January 8th from 5-7. 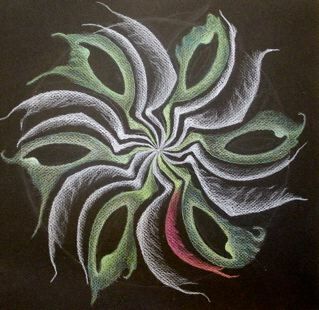 We will be showing many of our Mandala drawings through the months of July and August. We would love for you to stop by for the opening if you are in the area. with people of all ages and from all walks of life. Friday, July 8, 5:00 - 7:00 p.m.
Appetizers & beverages will be served. Mon - Fri, 10 a.m. - 4 p.m. Call for evening, weekend & holiday hours. Show runs through August 2011. 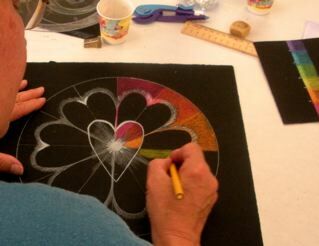 Creating Mandala's for Renewal and Healing. Please contact the Journey Center for more information. Well, there were a total of 8 of us, drawing in the heat of the approaching summer this past Sunday, in my studio in Santa Rosa CA. 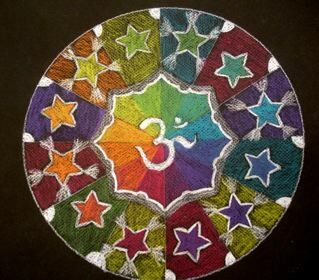 As the weather heated up, so did the vibrancy of color that emerged in everyone's mandalas. Here we all are at the beginning of the morning, as we began our day. Not everyone is shown here. out from the dark ground of the paper. Always so, powerful! along with the temperature of the room. 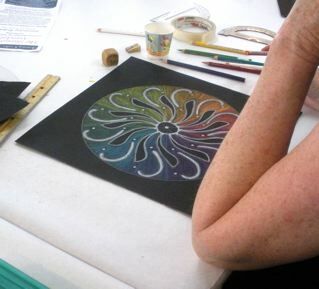 Often times it takes an act of bravery to add color to the already developed black and white mandala, which is always so stunning. But it is always worth the risk, and takes everyone to a new level of engagement and satisfaction. 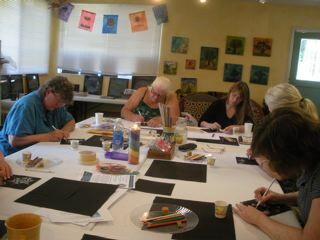 I love watching the image and colors emerge and how excited everyone becomes as their mandala's come to life. Here they are in the beginning stages of emergence, as color starts to blossom. We place them on the wall periodically, to stand back and view them, giving our eyes, hands and bodies a chance to rest from this very detailed work. This is a small Virgin of Guadalupe mandala, that Sue, drew along side her larger one, to honor an image that she photographed recently. 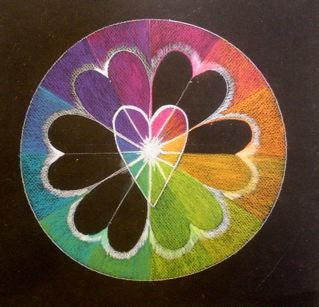 Working with the color wheel is a simple yet powerful way to create a beautiful mandala, that allows spirit to come through in a striking way. 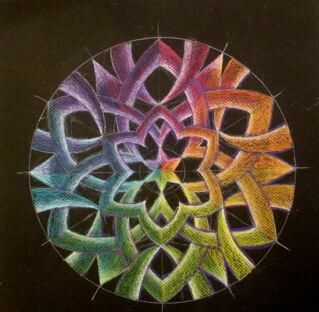 This is Patricia's mandala with all the color down, now she will develop it more fully. 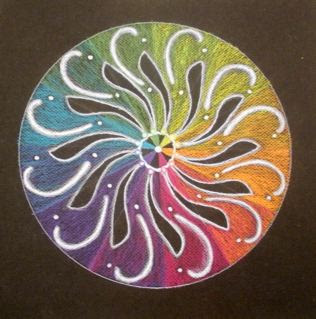 This is my mandala, I didn't get too far on the day of the workshop, I was feeling under the weather, and worked slow and since the workshop was at my studio, I had the luxury of taking an extra long lunch break and a nap that day. I will post its development in later posts. 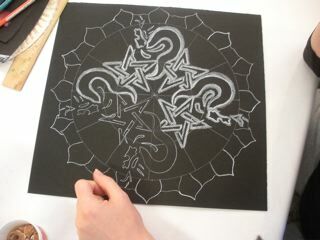 This is Lake's mandala, also still in process, I am so drawn to the quality of energy and movement in it. I look forward to seeing it as she puts more time into it. Yes! So powerful and with such a wonderful sense of movement. 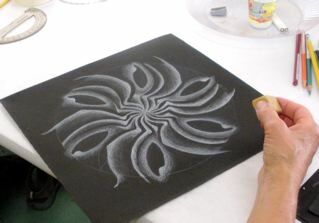 I love how this process, transcends peoples early art woundings, and allows people to see their creative potential. 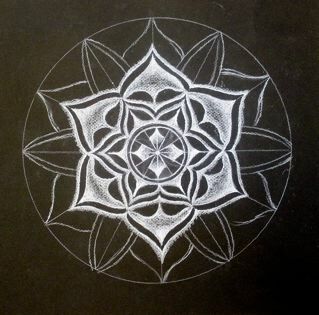 This mandala was done by Rusty, who didn't think she could create something new. 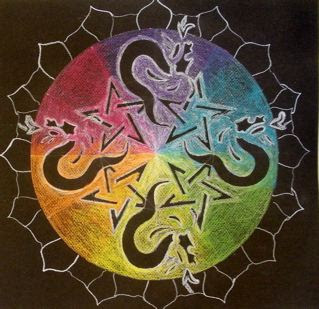 What a stunning and expressive mandala. She left feeling renewed and ecstatic about her creative possibilities. 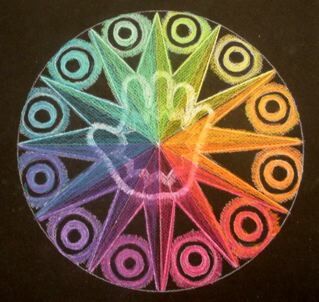 And lastly Sue's mandala, I love how the energy emits from the hand, radiating out in all directions. After initial hesitations about the hand, it worked out so perfectly. So thats it for now. If I get images back of completed mandala's I will post them here, as well as my mandala as it progresses. 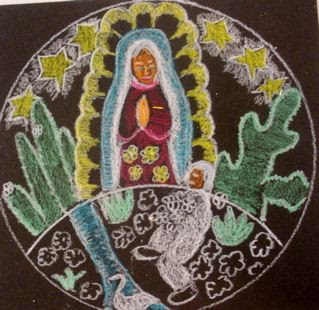 Blessings to all. In my ongoing expressive art group a week ago, I began a mixed media collage. Having fun with it for days afterwards, I created this this. I love maps, they elicit so many fantasies, and memories for me as well. I used to spend hours drawing them as a little girl, and then pouring over them with dreams of travel as I became a young woman. Even, now maps continue to hold a power over me, but in a different way. They are guideposts, signs leading to inwards reveries and imaginings. So, they often find their way into my art these days. 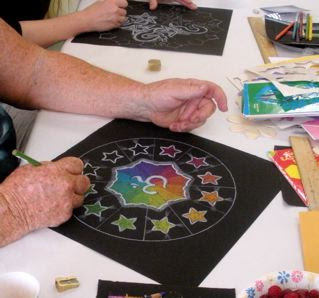 There are many art therapy directives that integrate maps and mapmaking into the art process, creating maps of your inner landscape, maps of your spiritual journey, maps of your life's path, maps of your journey in overcoming challenges. Creating mandala's is another ancient mapmaking process, the experience of finding your center, creating a way to orient to your own personal true north...and of course, just the experience of drawing a mandala is a map of the cosmos, both inner and outer. Oh how I love maps. My newest fantasy is to make a series of envelopes from old maps. We shall see if I follow through on that one. If so I will post them here eventually. Maps are a call to the journey towards the self. What do you do with maps? Show me!